Scor­ing is the process of cut­ting a num­ber of par­al­lel ver­ti­cal lines in the bark a piece of gouged, shaped, and pro­filed cane. These cuts make it eas­i­er to form the cane into a cylin­dri­cal tube and help pre­vent crack­ing dur­ing the form­ing process. Dif­fer­ent reed mak­ers have var­i­ous the­o­ries of scor­ing, involv­ing dif­fer­ent num­bers, spac­ing, length, and depth of score marks. There is also quite a vari­ety of tools one can choose from to actu­al­ly per­form the scor­ing, rang­ing from a $4 util­i­ty knife to Rieger’s €946 scor­ing machine. The tool I have used for years is close to the inex­pen­sive end of this spec­trum. 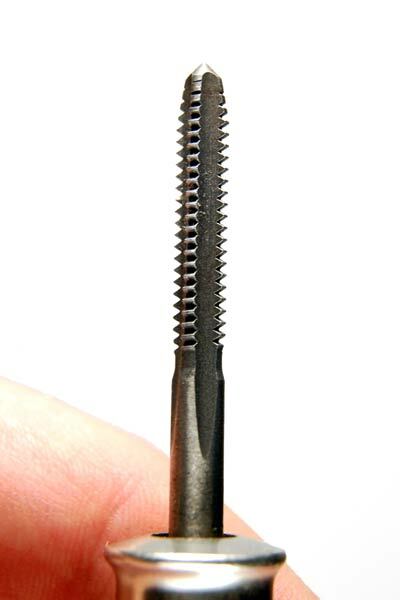 It is sim­ply a tap (a tool for cut­ting screw threads) mount­ed in a file han­dle. Left: file han­dle and tap. Right: assem­bled scor­ing tool. I cer­tain­ly can’t claim to have invent­ed this — I saw Pro­fes­sor James Lotz at Ten­nessee Tech Uni­ver­si­ty demon­strate such a tool when I was a bud­ding reed mak­er in high school. Miller Mar­ket­ing also sells a scor­ing tool that looks to be basi­cal­ly the same thing, made by 2XReed. I don’t remem­ber what the orig­i­nal tap and han­dle cost (I’ve been using the same scor­ing tool for about 15 years). But I recent­ly made a sec­ond one to keep in my office, and the parts came to a whop­ping $8. Here are a tap and han­dle sim­i­lar to the ones that I recent­ly pur­chased. If you’re lucky, the tap will just fit snug­ly in the han­dle — my first tool went togeth­er that way with a sim­ple fric­tion fit. If you’re unlucky (as I was with my recent parts), you’ll have to glue the tap into the han­dle to keep it in place. No big deal. There are prob­a­bly high­er qual­i­ty file han­dles out there with more con­sis­tent con­struc­tion, but this is what my local hard­ware store had. The spe­cif­ic size of the tap isn’t crit­i­cal — you just need some­thing with cut­ting teeth (close up at right) with the spac­ing you want to achieve in your scor­ing lines. I use a tap for cut­ting 10–24 threads; the 2XReed tap looks big­ger. If you actu­al­ly buy your tap at a hard­ware store rather than online, you can just looks at all the dif­fer­ent choic­es and pick one that looks right to you. And there you have it: eight or nine per­fect­ly par­al­lel score marks in a mat­ter of a few sec­onds. Above right you can see a piece of cane after a cou­ple of pass­es with the scor­ing tool. 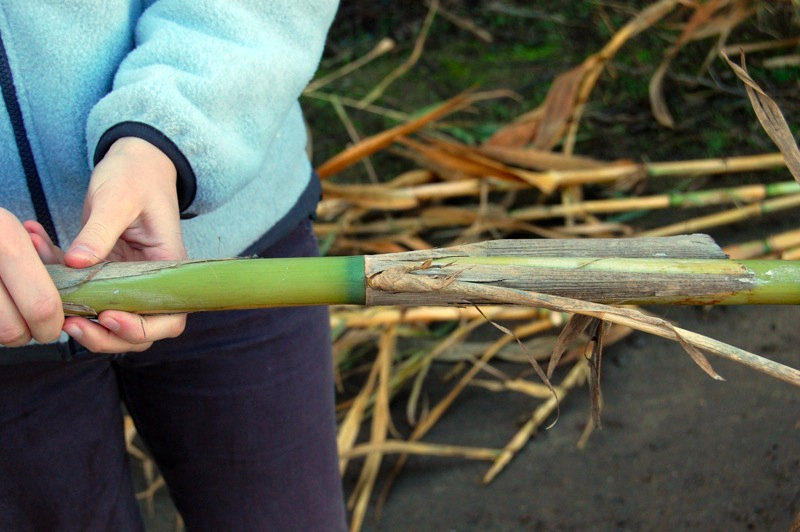 I went a lit­tle too high on the left side of this piece of cane, but it’s not a big deal. It does take a lit­tle prac­tice to align the cut­ting teeth prop­er­ly, and also to make the first cut per­fect­ly straight. But get­ting the hang of it doesn’t take very long, and pret­ty quick­ly you’ll be get­ting very con­sis­tent results. The one draw­back of this method is that it doesn’t quite cut as deeply as I’d like; I like my scor­ing to go all the way through the cane at the back end. So, I typ­i­cal­ly deep­en the marks with a util­i­ty knife — anoth­er pret­ty quick oper­a­tion. I have a num­ber of nice reed cas­es: a leather-cov­ered three-reed case that came with my bas­soon, a nine-reed wood­en case by Wise­man, and a cou­ple of beau­ti­ful maple cas­es by Roger Gar­rett. 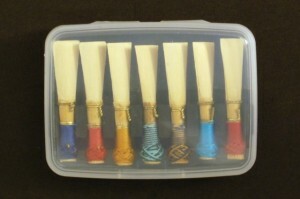 But I always seem to need more lit­tle box­es for trans­port­ing reeds for stu­dents, stash­ing French or peri­od bas­soon reeds, or just to hold over­flow from my oth­er cas­es. My go-to for this sort of thing is the tried-and-true Altoids tin. But Altoids tins are just slight­ly the wrong dimen­sions to be a tru­ly space-effi­cient reed case, and as a result I’ve always got my eye out for oth­er lit­tle tins or box­es. Ver­mints tins are a marked improve­ment (they’re a bit wider and shal­low­er than Altoids tins). But I recent­ly stum­bled across some lit­tle hinged plas­tic box­es at the Con­tain­er Store that are near­ly per­fect. 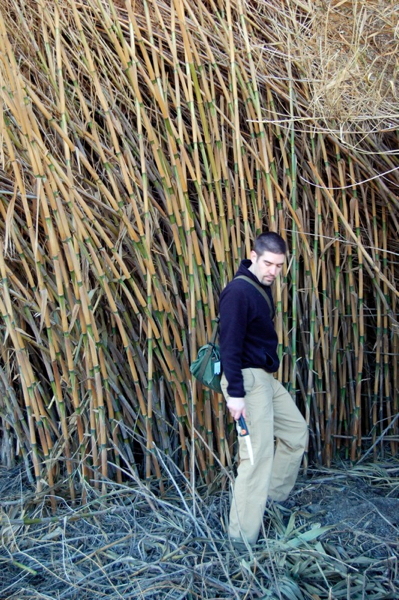 You can buy spe­cial­ly-made strips of reed foam from Reeds ‘n Stuff. I’ve used them, and they work well. But the foam hold­ers in my Wise­man case hold reeds in a more com­pact fash­ion, so I decid­ed to basi­cal­ly copy that design for this case. The Wise­man foam isn’t a pur­pose-made strip but is actu­al­ly made up of mul­ti­ple lit­tle pieces glued togeth­er: tall pieces to go between reeds, short pieces to go under them, and long strips at the top and bot­tom to hold it all togeth­er. Using that method I can fit sev­en reeds in this 94mm-wide plas­tic case; the Reeds ‘n Stuff strip would only fit five in the same space. The first step is to cut lit­tle pieces out of the foam sheet. The pre­cise dimen­sions will depend on the thick­ness of your foam — mine is 5mm thick. I decid­ed to make the top and bot­tom strips 6mm wide and the entire cen­ter assem­bly 15mm wide. The cen­ter assem­bly is made up of eight 12mm x 15mm blocks (placed ver­ti­cal­ly) and sev­en 7mm x 15mm blocks (placed hor­i­zon­tal­ly). I neglect­ed to get a good pic­ture of the foam assem­bly itself, but you should be able to fig­ure out how it’s put togeth­er from the fin­ished case pic­tures. After I cut out all the foam bits, I did a dry fit in the plas­tic box. I hadn’t account­ed for the box’s beveled edges, so I had to trim a bit of foam off the cor­ners of the end pieces. After a lit­tle tri­al and error, I had every­thing fit­ting snug­ly. I made sure the foam assem­bly was squared up to the edges of the box, and then I used my knife to light­ly score the box’s bot­tom to mark the foam’s posi­tion. I removed the foam, and then used some sand­pa­per to rough up the plas­tic where the foam would be glued in. The box’s sur­face is very smooth, so rough­ing it up a bit pro­vides the glue with a bet­ter sur­face to which to adhere. Then, it’s just a mat­ter of apply­ing glue to the box and to the appro­pri­ate areas of each piece of foam (where they’ll con­tact the box or oth­er foam), and assem­bling it all. I put in the upper nar­row strip first, then built the cen­ter assem­bly from left to right, then applied the bot­tom nar­row strip to square it all up. I cut some more bits of foam in basi­cal­ly a reverse pat­tern so that clos­ing the case clamped it all togeth­er while the glue dried. I picked Duco because that’s some­thing we bas­soon­ists tend to have lying around, but cyano­acry­late (super glue) may actu­al­ly be a bet­ter choice for this sort of plas­tic. Time will tell if I need to re-glue any­thing. Since I’m plan­ning to use this as an aux­il­iary reed case, I didn’t both­er punch­ing any holes in it. But if you plan to use one of these on a day-to-day basis and antic­i­pate putting your reeds away wet, you should pro­vide it with some form of ven­ti­la­tion. I bet a sol­der­ing iron could melt nice lit­tle air holes in this plas­tic — don’t breathe in the fumes, though. One note about using this case: the reeds are so close togeth­er that you have to tilt them slight­ly to fit them all in (you can see the tilt­ing and over­lap in the pho­to above). I’ve done this for years with my Wise­man case, but it might seem a lit­tle strange if you’ve nev­er done it before. There’s plen­ty of ver­ti­cal clear­ance on both sides for the reeds to sit safe­ly this way, and if you treat both reeds and case with the prop­er care, this con­fig­u­ra­tion shouldn’t cause any prob­lems. 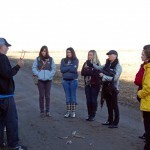 In a pre­vi­ous post, I set out the basic tools and mate­ri­als that I like my stu­dents to have. These are all nec­es­sary for my method and style of reed mak­ing, but I don’t need all of them every day. 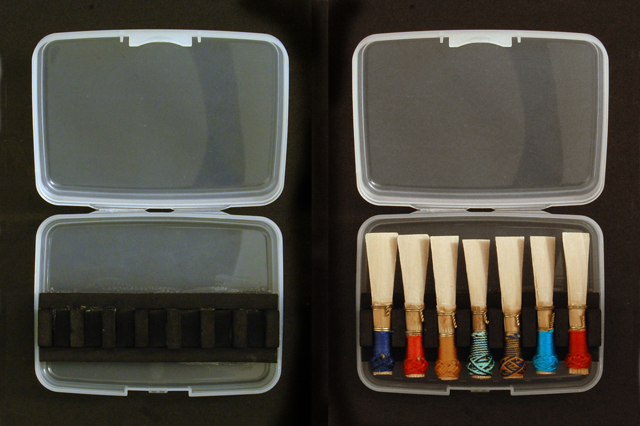 I keep a stream­lined set of tools in my bas­soon case for the dai­ly busi­ness of fin­ish­ing and adjust­ing reeds. 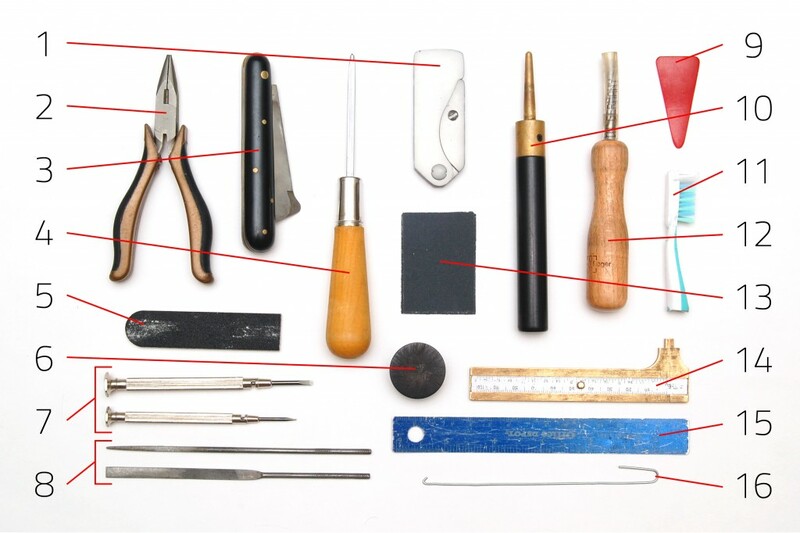 I’ve spent a good deal of time fig­ur­ing out what I tru­ly need to car­ry with me, and have acquired alter­nate ver­sions of some tools to keep my kit as com­pact as pos­si­ble. 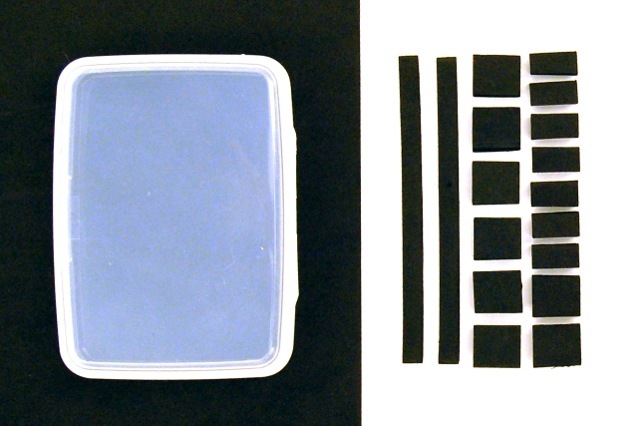 My kit also con­tains a cou­ple of items for quick instru­ment fix­es. I gave sources for some of these in my post on basic reed tools, so I’ll only pro­vide links for the new items. Util­i­ty Knife — My big Stan­ley knife is pain to haul around, so I car­ry this svelte Ger­ber EAB fold­ing knife instead. Pli­ers — Form­ing pli­ers aren’t nec­es­sary for dai­ly adjust­ments, so I car­ry this small pair of Crafts­man nee­dle nose pli­ers instead. Reed Knife — I like this fold­ing Fox knife for its small size. Hon­ing Steel — Reg­u­lar use of this Vic­tori­nox steel (made for pock­et knives and remount­ed in a file han­dle by me) lets me sharp­en my knife a lit­tle less fre­quent­ly. Emery Board — Half of a wide coarse board fits here nice­ly. Cut­ting Block — I pre­fer trim­ming reeds with my Reeds ‘n Stuff guil­lo­tine, but this and a util­i­ty knife will do in a pinch. Screw­drivers — These two jeweler’s-style flat­head screw­drivers came with my Püch­n­er, but can be eas­i­ly obtained else­where. Files — Just round and flat for dai­ly use. Plaque — Big, plas­tic, and red. Easy to see if you drop it onstage or in a dark pit. 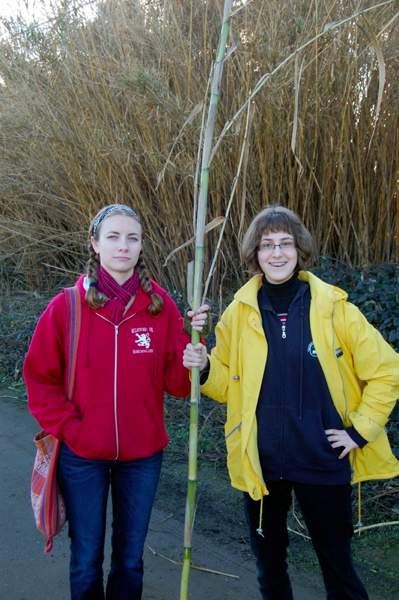 Large enough to use for con­tra reeds, too. Short (Hold­ing) Man­drel — Fox: sim­ple and com­pact. Tooth­brush Head — For quick­ly clean­ing shav­ings out of the ream­er. Ream­er — My trusty Rieger. Sand­pa­per — A stack of small rec­tan­gles (cut from a larg­er sheet) of 320 grit wet/dry lasts a while. Caliper — great for mak­ing repeat­ed mea­sure­ments on dif­fer­ent reeds. Ruler — Although I most­ly use the small caliper above, this small six-inch ruler takes up almost no space and comes in handy from time to time as well. Spring Hook — I made this out of a big paper clip years ago, and haven’t yet felt the need to upgrade to the real thing. All togeth­er, these tools cov­er about 99% of what I’ll ever have to do dur­ing a rehearsal or prac­tice ses­sion. 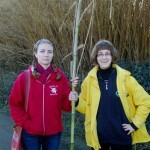 I wish I could car­ry my guil­lo­tine with me, but it’s just too big. 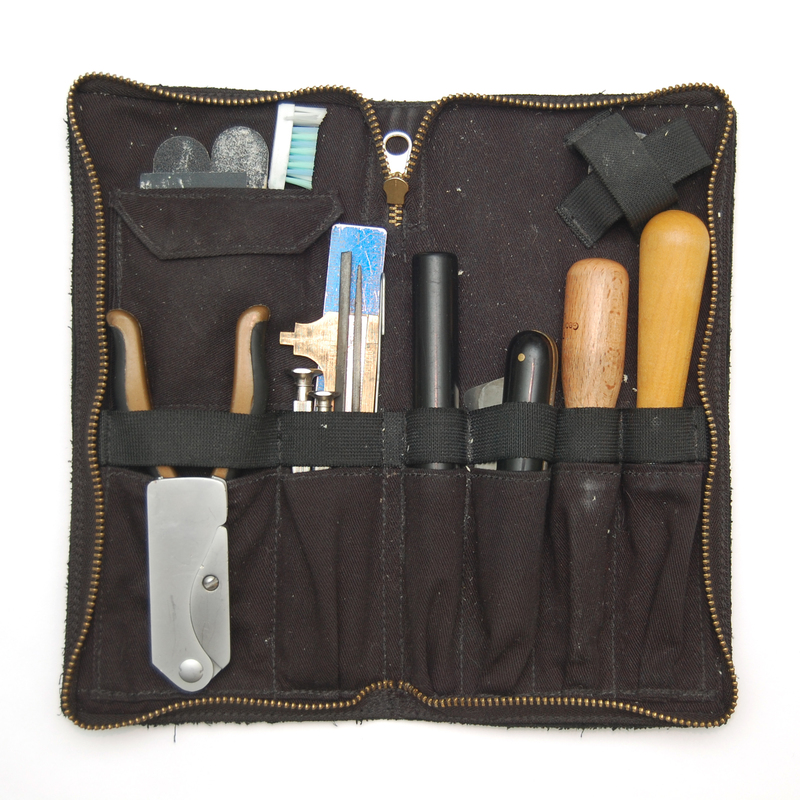 As you can see below, all the tools I’ve list­ed above fit com­fort­ably into my leather tool wal­let, which itself fits very nice­ly into the acces­so­ry pouch of my Mar­cus Bon­na Gentleman’s case. No cram­ming nec­es­sary! Over the past cou­ple of weeks, I’ve been cor­re­spond­ing with one of my incom­ing fresh­men about what reed tools and mate­ri­als he’ll need when he arrives at school in the fall. This has inspired me to assem­ble a real list of the equip­ment that I want a begin­ning reed mak­er to have. I’ve combed the three dou­ble reed spe­cial­ty shops that I typ­i­cal­ly do busi­ness with (For­rests Music, Mid­west Musi­cal Imports, and Miller Mar­ket­ing) along with a few nation­al chains (Ace Hard­ware, Home Depot, and Wal­greens) for the best prices on my rec­om­mend­ed items. There are a cou­ple of things that I rec­om­mend get­ting from Bar­rick Stees and Christlieb Prod­ucts, as well. For most items I’ve also list­ed oth­er options, in case you’d like to buy a bet­ter knife, or save on ship­ping by order­ing from few­er mer­chants. I won’t go through exact­ly how I use all of these now — that’s a top­ic for anoth­er post. Form­ing pli­ers (with a smooth hole in the jaws for shap­ing the tube of the reed) are a spe­cial­ty item, and there aren’t too many choic­es in brands. I pre­fer the orange han­dled Knipex/Rieger ver­sion. These have larg­er han­dles than some of the oth­ers, and are very well made. They also hap­pen to be the least expen­sive of the bunch. I own a a few dif­fer­ent knives, and each one has things I like and things I don’t. I think all that real­ly mat­ters is that you find some­thing that fits your hand com­fort­ably and that you can keep sharp rel­a­tive­ly eas­i­ly. Any basic util­i­ty knife will do. I like the kind that take the stan­dard trape­zoidal blades, rather than the ones with sec­tioned snap-off blades. These (along with extra blades) should be easy to find at any hard­ware store. My stan­dard knife is a beefy-han­dled retractable Stan­ley that holds extra blades inside. I have a cou­ple of these, one by Fox and one by Rig­ot­ti. There are many oth­er brands to choose from, too — all that real­ly mat­ters is that you find one that’s con­fort­able in your hand. I hate the sound a knife makes when it scrapes on a met­al plaque, so I stick to plas­tic ones. Again, I have a few of these, but my favorite is a big red one that also works for con­tra reeds and is easy to spot when (not if) you drop it in a dark pit. Good ream­ers are sharp, have mul­ti­ple flut­ed spi­ral blades, and are pre­cise­ly made to match the taper of a bocal. As a result, they aren’t cheap. Ream­ers get infre­quent enough use that a new stu­dent can sub­sist for awhile by bor­row­ing those of his or her stu­dio­mates. But any­one doing seri­ous reed mak­ing will need one even­tu­al­ly. I like my Rieger ream­er, but there are good ream­ers for a lit­tle less mon­ey, too. I like to heat my form­ing man­drels before using them (to make the cane more pli­able dur­ing form­ing), and have found a small hand­held butane torch to be the best heat source. These come in a vari­ety of shapes, sizes, and prices. Mine is an inex­pen­sive hard­ware store mod­el that sim­ply takes butane lighters as car­tridges. This is anoth­er item that can be bor­rowed from stu­dio­mates ini­tial­ly, if nec­es­sary. 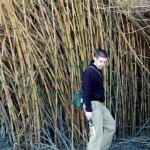 I like to form reeds on long man­drels, then allow them to dry before remov­ing them. My pins, which I love, were made by Accu­rate. Sad­ly, they’ve now gone out of busi­ness, but you can buy sim­i­lar racks/pins from oth­ers. My easel is just a six-inch sec­tion of tool han­dle that my under­grad­u­ate teacher, Dr. Jef­frey Lyman, cut for me. A 1.25″ dow­el will work too, but I pre­fer the high­er-den­si­ty tool han­dle wood. You can get very nice pur­pose-made easels too, but I’ve nev­er seen the need to shell out for one. 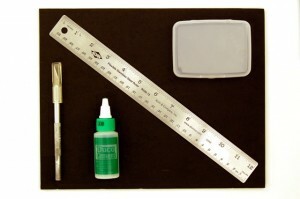 The cheap­est and eas­i­est to find is a sim­ple six-inch ruler — just make sure that it has mil­lime­ter mark­ings. Some peo­ple make exten­sive use of files in their reed mak­ing; I don’t. 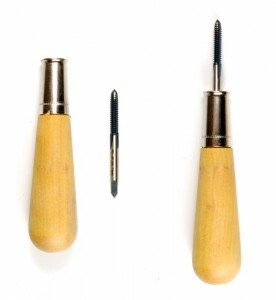 I use a round file most often, and occa­sion­al­ly pick up my flat and tri­an­gu­lar files, too. You can buy very nice dia­mond files indi­vid­u­al­ly, or get a six-pack of assort­ed files from most hard­ware stores. A word of warn­ing — be sure to wash your files before use. 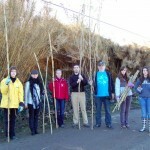 They often have resid­ual machin­ing oils that will make your reeds taste awful. One pack­age of 320 grit wet/dry sand­pa­per (usu­al­ly black or dark grey) will last quite awhile. Coarse emery boards work like sand­ing blocks (pro­vid­ing a rigid sand­ing sur­face), but are less expen­sive, eas­i­er to man­age, and more com­pact. 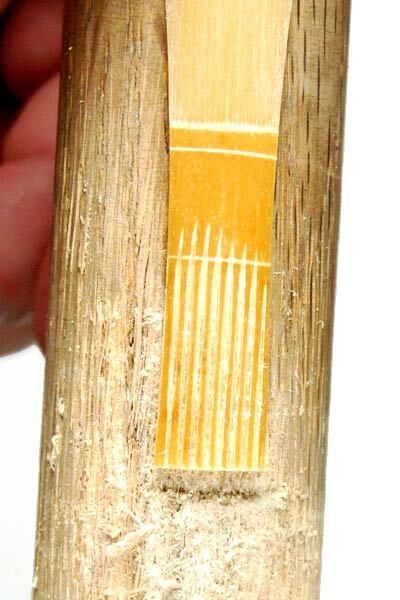 A sur­face to use when trim­ming the tips of reeds. A block with a diam­e­ter greater than 1 inch is best for bas­soon reeds. 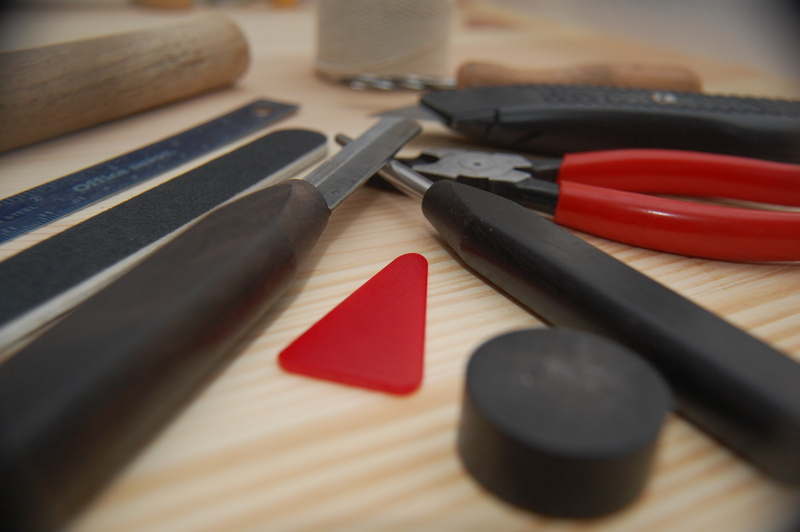 Anoth­er hard­ware store item — I use thick cot­ton string to wrap cane dur­ing the form­ing process. Some­times you can find this in a hard­ware store — make sure it’s 22 gauge, though! Larg­er spools can be ordered from pret­ty much any dou­ble reed sup­pli­er. I pre­fer nylon size FF thread. This also is avail­able from most dou­ble reed shops — in lots of col­ors! The old stand­by reed adhe­sive. Duco is avail­able in both met­al tubes and plas­tic bot­tles — which you buy is a mat­ter of per­son­al pref­er­ence and what your store stocks. These are the items that I con­sid­er essen­tial for my own style of reed mak­ing. Oth­er play­ers and teach­ers will like­ly have some­what dif­fer­ent lists. In list­ing the best prices for these items, I have tried to find tools that are suf­fi­cient for a begin­ning reed mak­er. They cer­tain­ly aren’t the only options, nor are they all the spe­cif­ic mod­els that I use on a dai­ly basis. If you buy all of the “Best Price” items on this list, it comes to about $320, not includ­ing tax or ship­ping charges. This may seem like a lot, but con­sid­er that with com­mer­cial reeds at $15–20 a pop, mak­ing your own reeds will recov­er the cost of tools in rel­a­tive­ly short order. If you real­ly want to, you can wait on the ream­er and torch, bring­ing the total down to about $220. There are tools I use fre­quent­ly that I haven’t includ­ed on this list, because there are ways of accom­plish­ing the same tasks with those I have list­ed. You will, of course, need some­thing to put all of these tools in. For­rests, Mid­west, and Miller all car­ry nice tool pouch­es, but you can also just use some­thing you’ve already got or even the ship­ping box your tools arrive in. 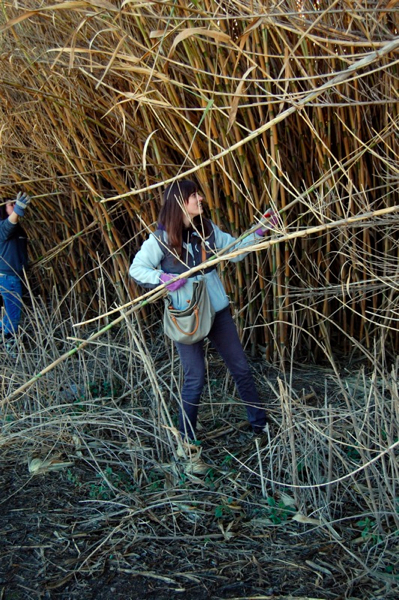 There is one addi­tion­al item with­out which all of this is use­less: cane! But that’s a sub­ject for anoth­er day. Although I’ve made this list pri­mar­i­ly for my own stu­dents, I hope that it will prove to be use­ful for oth­ers, as well. Hap­py reed mak­ing! The day before the Meg Quigley Vival­di Com­pe­ti­tion and Bas­soon Sym­po­sium start­ed (see pre­vi­ous post), Stock­ton Sym­pho­ny con­tra­bas­soon­ist Lar­ry Rhodes (shown at right with San Fran­cis­co Sym­pho­ny con­tra­bas­soon­ist Steve Braun­stein) led a small group of us on a cane har­vest­ing expe­di­tion. 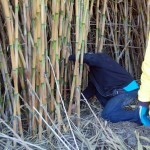 Giant cane (Arun­do don­ax), which we bas­soon­ists use to make our reeds, is clas­si­fied as an inva­sive pest in Cal­i­for­nia. 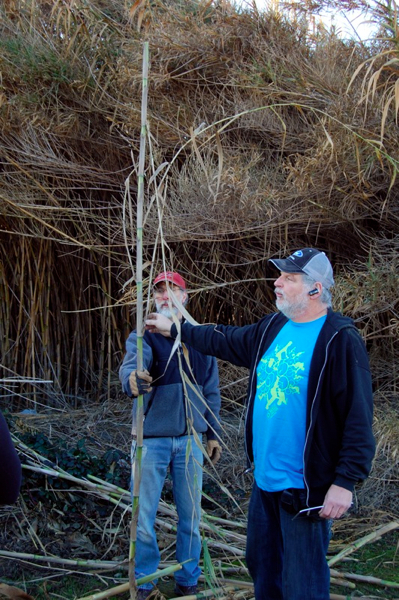 It tends to grow in streams or marshy areas, and is pri­mar­i­ly prop­a­gat­ed by pieces float­ing along water­ways and tak­ing root in new loca­tions. 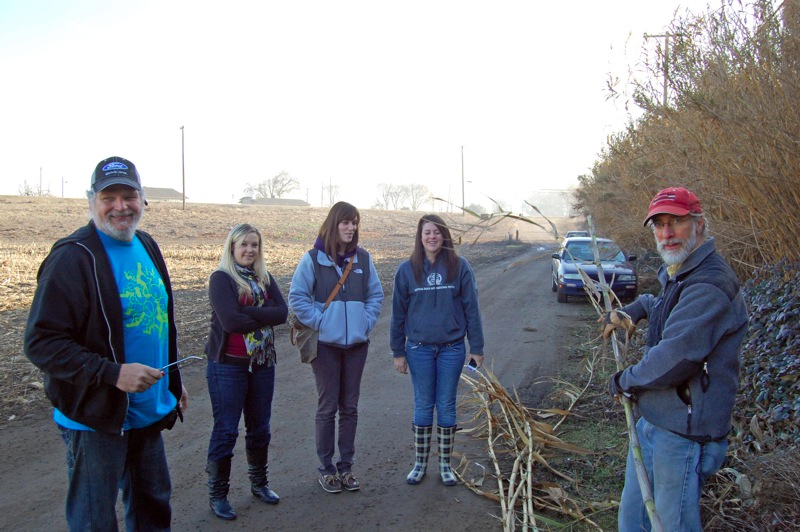 The area sur­round­ing Stock­ton, most of which is part of the San Joaquin Riv­er Delta, is host to many stands of cane. Lar­ry found a par­tic­u­lar­ly promis­ing look­ing cane stand via Google Earth, then went in per­son to scope it out and obtain per­mis­sion from the farmer on whose land it sits. 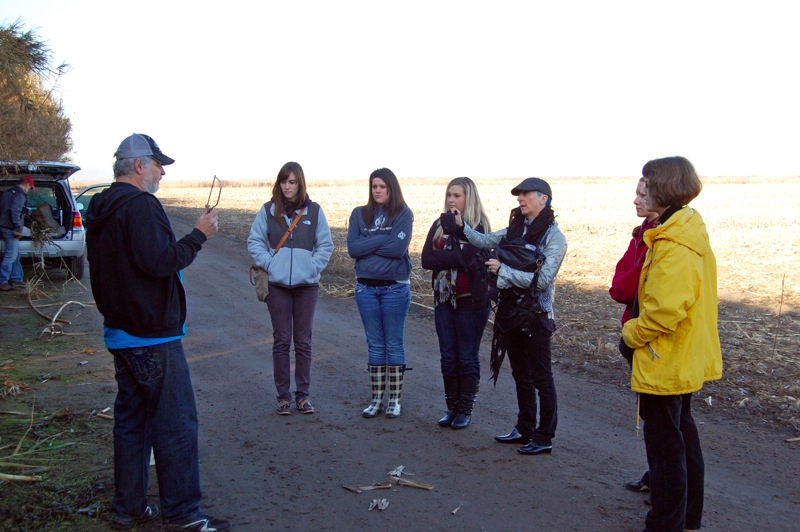 Two car­fuls of us drove out to the spot, about 25 min­utes west of Stock­ton, where we met Lar­ry and Steve. 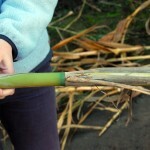 Lar­ry showed us some of the cane he’d already cut, using it to demon­strate what we should be look­ing for in terms of diam­e­ter, growth pat­terns, and col­or. 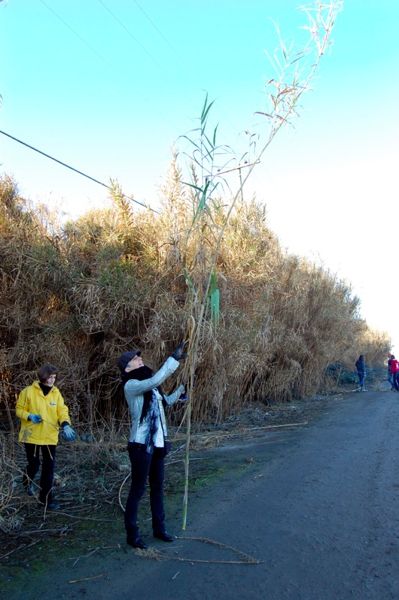 In short: for bas­soon reeds you want green cane, about an inch in diam­e­ter, that has branch­es grow­ing fair­ly low to the ground. 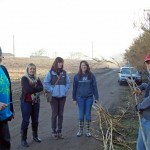 He then set us loose in the cane patch. 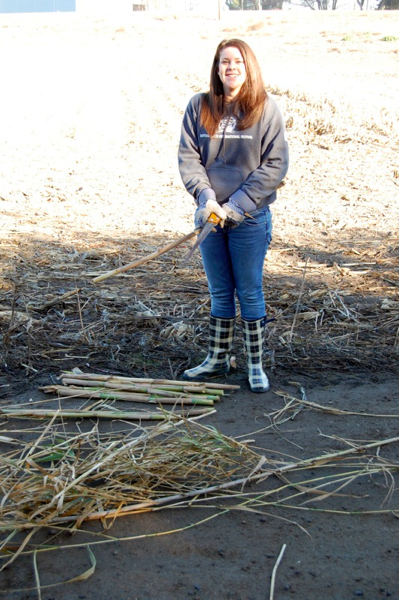 Armed with the small saws we’d brought, we spread out and start­ed clam­ber­ing in amongst the cane. It became obvi­ous very quick­ly that very dif­fer­ent ages of cane grow all togeth­er. 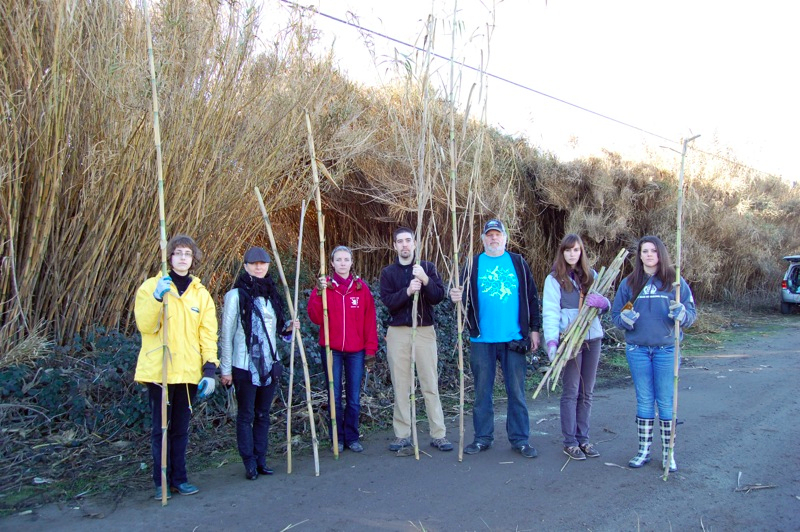 It took care­ful search­ing to find stalks of the prop­er size and age amongst lots of too-small, too-young, and dead stalks. 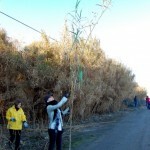 We all start­ed out slow­ly, cut­ting one stalk at a time and tak­ing it to Lar­ry for inspec­tion. But, pret­ty soon we got the hang of just what it was we were look­ing for. 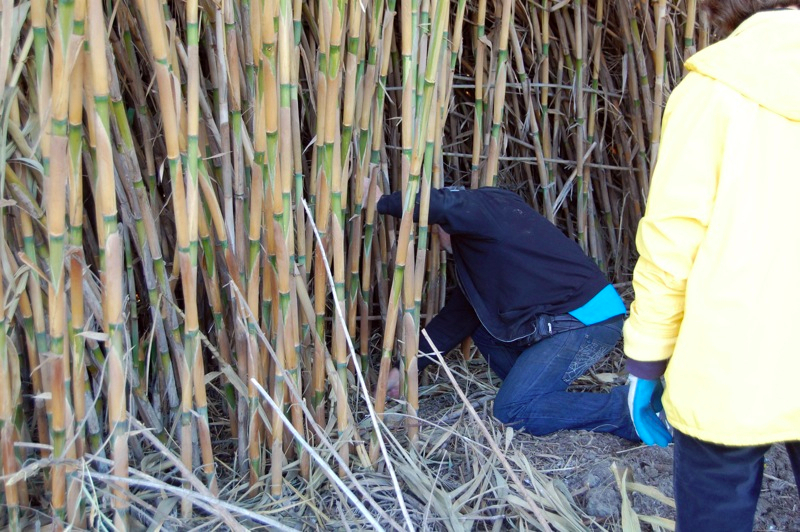 The one thing we hadn’t thought about was how we’d trans­port the cane back to Stock­ton (or back home, for those who’d flown in just for MQVC). Lar­ry tied 80-some­thing stalks to the roof of his sta­tion wag­on, but our hauls were much small­er. 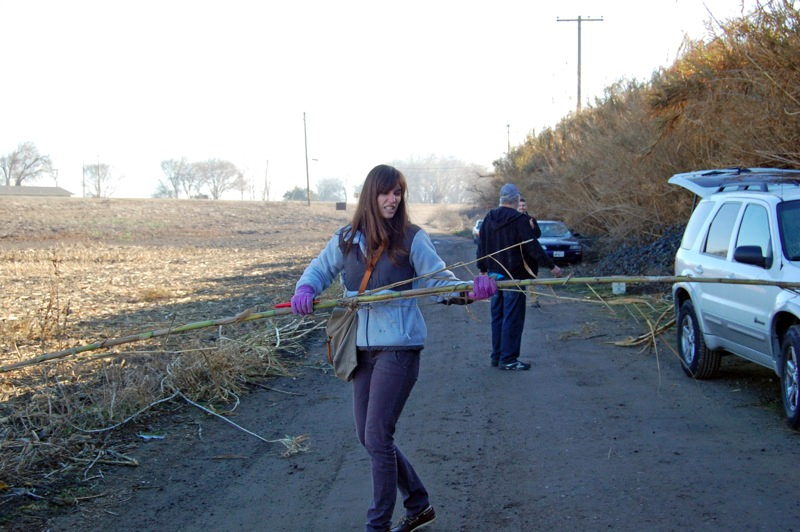 I end­ed up with about eight stalks, although I had to cut them in half to fit them in my car. 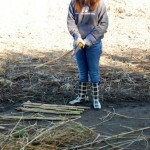 After strip­ping the branch­es and dis­card­ing bro­ken or too-small pieces, I now have just over a dozen five-to-six-foot sec­tions of cane. They’re now stuck up in the rafters of our garage, where they’ll sit dry­ing for the next six months or so. After that, I’ll prop them upright in the sun for about two weeks months to com­plete the cur­ing process. 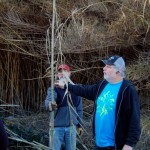 Then, I can cut ’em up, split the tubes, and get going on turn­ing my har­vest into reeds!